Brand New Bingo is a hot new UK bingo site, offering a variety of games, bonuses, guaranteed jackpots and FREE no deposit bingo! 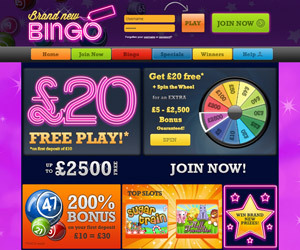 The site's bright and vibrant design is sure to get you in the mood for loads of bingo fun! Brand New Bingo promises some of the best 75 and 90 ball bingo games online. We don't stop at just bingo, though. You can also enjoy all of your favourite slot games, including Sugar Train Slots and Fluffy Favourites. 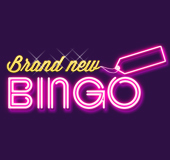 Brand New Bingo has a fabulous welcome bonus for all new players! Receive £20 absolutely FREE upon your first deposit of just £10. It doesn't end there, though. 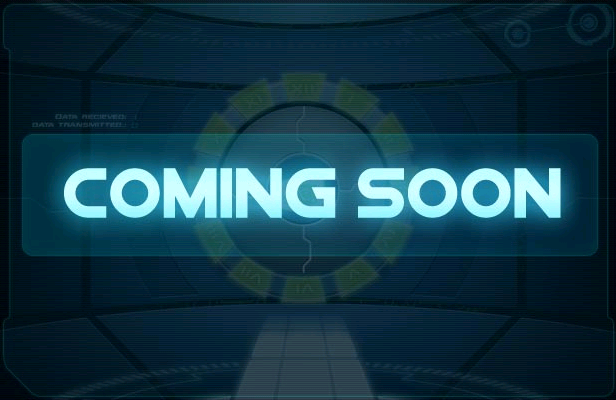 You will also get to Spin the Wheel where you will win an additional £5 to £2,500 guaranteed! Brand New Bingo has Brand New Prizes every month! Each wager of £10 will automatically enter you into the draw for our exclusive monthly prizes. Our first prize was a 42-inch Full HD LED TV, and we promise they will only get better! Another hot promotion available just for you at Brand New Bingo is Friday Night Takeaway. You have a chance to win every Friday at 8pm in the Lucky Stars room. If you win the Full House, you will dine for free the following week! It's simple: win the Full House, receive an email a few days later, fill out details of a restaurant of choice plus your address, and you will receive a special takeaway meal worth £50 on us! Bon appetit! Brand New Bingo is dedicated to all of our fab players. We are operated by Jumpman Gaming Limited, which is fully licensed and regulated to ensure the best and safest online gaming experience. Our software has been tested and approved by SQS, so you can rest assured your personal information and deposits will always be secure.